The Burn1 is a revolutionary device that was designed with the automotive enthusiast in mind. it supports chips used in our products aimed at ECUs/ECMs from the late 80s and early 90s. Before the Burn1 was developed, there were only a handful of chip burners known to be compatible with these chips. These burners were usually not cost-effective, used outdated PC interfaces like a parallel Printer port. They also required external power supplies, so forget burning on the fly. Examples include the $160 Pocket Programmer II. The Burn1 was revolutionary with its simple USB interface that provided all power to the unit. An internal DC voltage step-up circuit is used to provide the high erase voltage required on certain chips. The latest generation of the Burn1 is the Burn2. 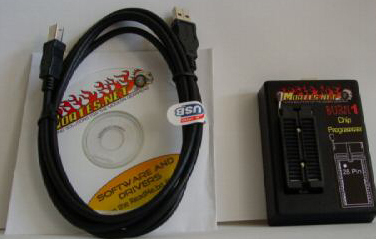 It has the same same command set and features as the Burn1 but has a smaller size.